Making the reservations was easy, staff very friendly and professional. Loved the Farmhouse, met all of our expectations. It was perfect for our visit, loved the creek, house was very comfortable. Will definitely stay at the Farmhouse again. The property was amazing it was very secluded but not far from the grocery store. The cabin was beautiful it was a lot of space. The hot tube and pool table were great to have on our rainy weekend! Definitely would stay again and will tell everyone thats where they need to stay when they take a trip to the mountains! great experience both times we stayed from booking over the phone till the very end. we loved honeymoon creek! we will definitely be back again.the sound of the creek is amazing and is so nice to sleep to. We LOVED the property. It was the most romantic relaxing anniversary weekend. "The Cottage" is a quaint place to stay. The weekend we stayed, the creek turned into a river due to all the rain, which made watching it fascinating. We enjoyed the hot tub and listening to the rain hit on the metal awning that covered it. The fire pit beside the river was a great touch. 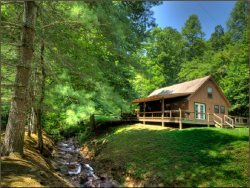 We visit the area at least three times a year and have stayed with Hidden Creek Cabins several times. This was out first stay at "The Cottage". We enjoyed ourselves so much that we have already booked a week in April to visit it again! Beautiful cabin , perfect for two , beautifully decorated , loved being able to head the creek , loved the fact that you had a king sized memory foam bed with great bedding weve stayed in cabins in the past n everything was good except we could not sleep well bc of the cheap bedding you guys have done well in furnishing your cabin we slept well every nite and thouroghly enjoyed our stay , we were able to relax the cabin is so inviting . We had a wonderful time . The fireplace in wall for bedroom n bathroom was a plus . Highly recommend to any coupe who needs rest n relaxation . Cabin was beautiful and the hot tub by the water was awesome. Clean and beautiful cabin. Would recommend this cabin to everyone. Will stay here again. My family and I absolutely loved the Alarka cabin. We had a fabulous time. It was cozy, peaceful, and relaxing. We will be back in the future. It was really nice. We stayed in the honeymoon heaven cabin and it was amazing. Definitely looking forward to going back. Very relaxing and cozy. One of the best weekends we've had in a while. Very friendly and helpful staff. Nothing but positive comments from us!!! Thanks. Everything from the reservation process to the stay itself was fabulous. You all are doing a great job. The reservation system was flawless and the builder and owner should be proud of the property. We'll definitely be back and I've already recommended your properties to others. Thank You!